Here is another attempt to create a pinball app. I have to add other elements as the holes that catch the ball and throw it again in play, and others. I'd also like to create some kind of pinball editor, in the sense that most of the elements can be described as list of numbers in an CSV ASCII file. 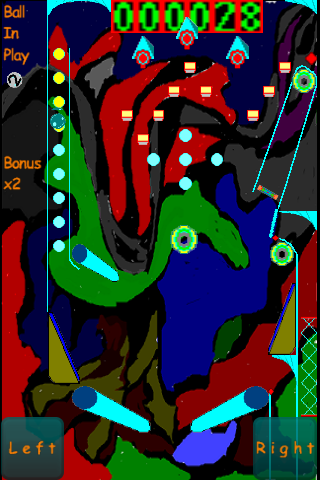 So the user could create its own pinball layout, or better could I and publish in the Internet. 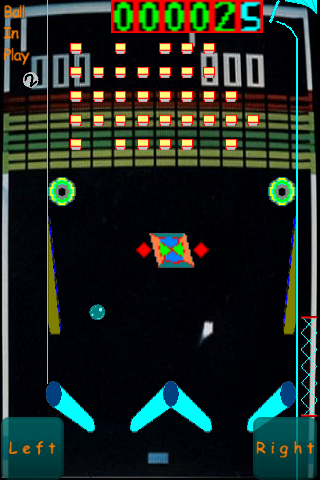 So we could have different pinball layouts loaded from the Internet or simply packaged into the app package. Since I have few time, I think that I'll develop 2 or 3 different pinball layouts, and I'll make the player choose the wanted one, or during the game the table could switch from one layout to another because of hitting some target. What do you think about? Consider that the screenshot is taken from Windows PC with setPhysicsDebugOn(). I attach again the screenshot, it has been badly cropped. Finally my App-In-Ball game is coming to life. - fully editable pinball tables: on Windows you can create whatever flipper you wants simply combining 16 elements like a Lego game, comprising bumpers, flippers and so on. You create a .dat text file according to a simple CSV format. On Android there is no such possibility, so I'll supply the app with a certain number of pre-made pinballs layouts. At present there is no graphical editor, if I met some success on the market, I may consider the effort. - fully configurable pinball behaviour. 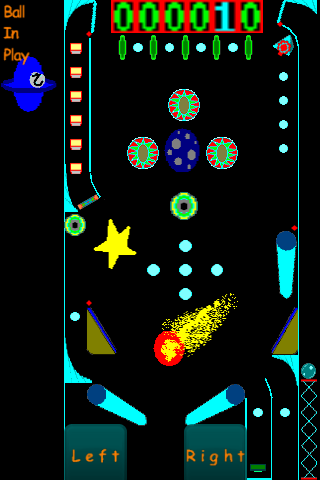 Bonuses multipliers, shoot again, ball savers, ball-catching holes lighting, can be activated based on the player hitting groups of targets that can be defined by the pinball creator. - last but not least, Box2D perfect physics, plus some physical effects I created to make the game more realistic. I have now to create more tables, testing, and putting on Google Play. Previous image was the menu where to choose pinball. Here is the pinball during the play. Maybe improve the grafix a bit ? If you improve it too much then the ball wont run as smooth. Quote: "If you improve it too much then the ball wont run as smooth." Well, possibly, but I doubt AppGameKit will slow much just by improving the look of the graphics, only if you add more in. 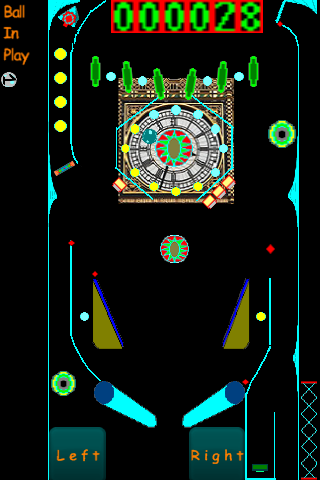 It reminds me of a pinball sim I started in AppGameKit, it's graphically very similar(bright colours and not much detail). I never intended those to be the actual release graphics though. It depends on what you want I suppose, at the minute it looks very retro. Still, a pinball game can live or die on it's graphics, and you really want to spend as much if not more time on those, than the actual program. Pinball Dreams and Fantasies would probably not have been as popular if the graphics weren't as good as they were. Perhaps a video as well to see how it plays? I would also consider posting your pics using the image button when you post. I sometimes don't even look if the picture isn't in front of me. I'm sure I'm not the only one, and I am sure you want as many peeps to see it as possible. Performance is not heavily affected by the high number of physics sprites on the field, maybe because they are little. Anyway me (and 3DPointInSpace because he told me that) had some performance problems in the past. I partially improved graphics by adding some background and additional elements as spinners and targets (not drop targets). A special graphic designer (my wife that is a good artist) helped me with some artistic background (see waves table). Others are my creations, as the altered Big Ben picture in TheClock. I published the pinball app in the Google Play Market (not for free). I also added it to the AppGameKit gallery. You can find some screenshots on the gallery or in the market. I really liked the physics, well implemented, what I did not like that much is the way the screen is scrolling up and down. It should follow the ball some more, not fast scroll up when the ball is going to the very top. A scroll that lags, abit after the ball, and moves in a sinus pattern would be more natural and smooth. 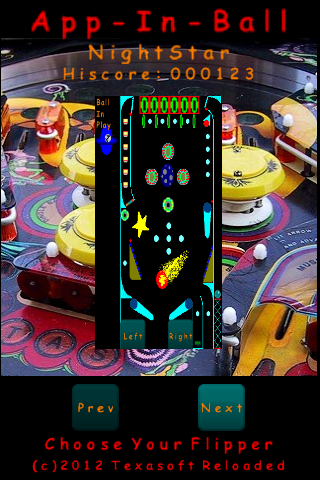 Try to achieve scrolling like this one, and you have a killer pinball app! My only suggestion is maybe some cleaner grafix without so much patterns and stuff? Looks a bit messy on an small screen. Cool table selection and everything. You will probably sell this app easier with the first table free as an demo! Quote: "My favouritte pinball game on the Amiga:"
1) The way Amiga pinball implements scrolling is far more smooth and natural. I'll update my app asap. Now I am setting an Internet score table, so I could make update the records from/to the Internet. 2) Maybe I have to rationalize a little the stuffs on the tables, especially where there are too many near objects. Art could be improved, my art supplier (that is my wife) is more a painter and creative for "material things" like Christmas gadgets, painted boxes, etc, than computer arts. So she gave me some background, but much of the work has been done by me. BTW, I am particularly proud of "TheClock" table, where there is a Big-Ben clock with targets insted of hours. It was an idea of mine. 3) The idea to put a free version with only 1 table is good, but I fear that people would be happy with only 1 table and would not buy the complete version. Maybe a 1 table version with only 1 ball? Norway and Sweden are very nice, I heard it from all people who went there, unfortunately are expensive for us living in PIIGS countries, and, THANKS TO €EURO€ and our corrupted previous "Burlesquoni" governments (it is not a mistake), and also thank to a great part of the citizens that are corrupted as the governors, we have to watch the cost of living of countries we travel to. Implemented the smooth scrolling as Impetus suggested. I do not know if it is "sinus patters" as he mentioned, but anyway now is better. With 2 table, the tables scroll when the ball goes above the half of bottom (lower) table or below half of the top (upper) table. 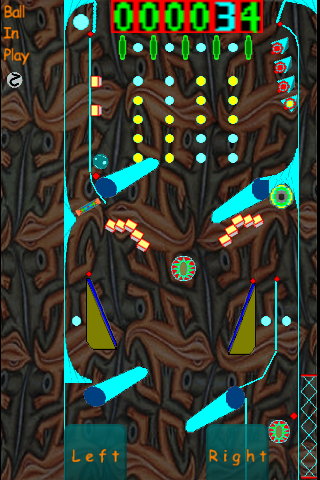 It is similar to the Amiga Pinball behaviour. I added sound on/off and quit button. I improved a little the ramp graphics, and others. version 2.1.2 is online. I had some problems when building the Tier-1 app, the AppGameKit player appeared instead of my app. But in another thread I learned that TGC changed the assets folder structure: now I have to put all "media" folder inside the "assets" folder, instead of putting all the single files directly into the "assets".